The other Italy is an earthy world inhabited by real salt-of-the-earth people whose priorities in life are not being stylish and sophisticated but enjoying food, family and the simple pleasures in life. It is within this category that most Italian food falls, for where other countries have a rather clear distinction between haute and peasant cuisine, Italian gastronomy is remarkably homogenous. In my view this is because it is so singular, engrained and built upon a standard of good, honest quality ingredients. Rich or poor, Italians enjoy the same range of pastas, antipasti and main dishes built around regional raw materials, and somehow it means that you don’t have to go to a posh restaurant to enjoy gorgeous dishes made from quality produce. Grand restaurant, osteria, agriturismo or indeed someone’s dining room, they all promise to be delizioso! 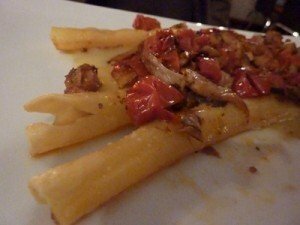 Though I’m no expert I would imagine that Calitri offers fare that is typical of rural Campania, with cheese, onions, garlic, tomato, pasta, cured hams and pork as the building blocks. 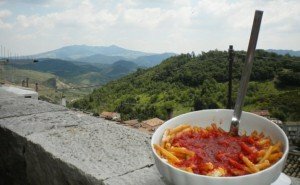 The local pasta speciality is Cannazze, a hearty meal of thick Casarecci pasta with meat sauce. These thick, twisted tubes are about 4cm long, delicious and filling, but for Italians they are merely the second of four mealtime courses. Italians and Germans seem to eat more than most but remain pretty obesity-free. This is especially true of the Italians, so feel free to tuck in. Before the pasta comes the antipasti, and though some of the restaurants in Calitri don’t have menus but simply bring you what they have, this will usually be a mouth-watering array of bresaola and mozzarella di bufala. Along with fresh country bread and a carafe of red wine, this usually makes a pleasant lunch itself. After these two courses comes the main, in these parts usually a delicious pork chop with potatoes and local vegetables, followed by a dessert. We tend to go to different restaurants in Calitri, as well as agriturismos in the surrounding countryside, but my favourite dessert is the panna cotta at Osteria Tre Rose. The local supermarkets are little family-run businesses stocked to the hilt with gorgeous meats, cheese and fresh pasta, and we love to stock up there, but Thursdays you’ve got to make it to the fresh produce market, where they’ll even give you tips on how to get the best out of the plump pomodoro, vegetables, olives, fruit and charcuterie. Making a simple but delicious pasta dish or even just a salad with fresh bread and a glass of wine as you look out over the green fields from the open French windows at home is a treat as good as any restaurant. Try the same thing elsewhere and it’s never quite the same; a bit like how good Guinness tastes in Ireland or mint tea in Morocco, reminding you that Italian food is best enjoyed in Italy. This entry was posted on Wednesday, September 12th, 2012 at 7:21 pm	and is filed under Calitri, Food & drink, Freelance Writing, General Interest, Italy. You can follow any responses to this entry through the RSS 2.0 feed. Both comments and pings are currently closed.